Mirvac has released the second stage of its highly successful strata-free Wharfside Residences and Cargo Homes in Melbourne’s Yarra’s Edge, with the Wharfside Residences sold out and only one Cargo Home in stage one remaining. Fast tracked to the market to cater for demand, the national developer has released a further six Wharfside Residences and three Cargo Homes as part of the first release in stage 2 of Wharf’s Entrance precinct at Yarra’s Edge. Situated closer than any other inner-city residences to the Yarra River, the four level Wharfside Residences enjoy never-to-be-built-out, north-facing views over the river to the Melbourne city skyline, while the flexible Cargo Homes provide solutions for living and working across three levels with the ground floor home office geared towards a work environment. Wharfside Residences[/caption]Mirvac’s Head of Residential John Carfi said the demand for this collection of inner city homes by the Yarra River was high and they were expected to sell fast. The first stage released in September last year achieved a 60 per cent sale rate within weeks of its launch. “Rare and highly sought after, these residences have seen strong interest from owner occupiers, especially with those in the medical fraternity and entrepreneurs who want a home in a tranquil, yet convenient location,” Mr Carfi said. 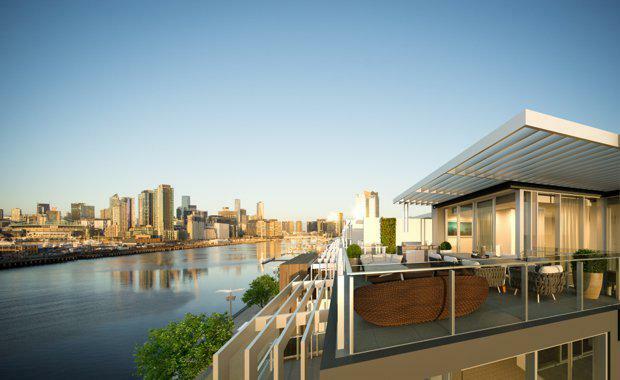 Mirvac’s luxury Wharfside Residences feature four bedrooms across four expansive levels that overlook the Yarra River. Ranging in size from 295 square metres to 390 square metres internal, they feature personal lifts and generous outdoor living areas, including a rooftop terrace. Stage two Cargo Homes will provide residents with unique self-contained home offices that can be sub-let, converted to teenage retreats or separate guest suites at ground level, with three to four bedrooms split across the remaining two floors above. These homes range from 234 square metres to 300 square metres internal. Cargo Homes[/caption]“Reflecting the way the line between work and play has become blurred, the Cargo Homes aren’t designed to be two separate parts. Rather, they are conceived as a beautiful family home with the option of a home office,” said Mr Carfi. The Wharf’s Entrance precinct will also feature 228 apartments across the 30-level Forge tower and the Wharf Club, a health and wellbeing facility to be housed beneath an inclined grass roof.